Issey Miyake Nuit d'Issey is a leathery, woody, fresh Eau de Toilette. A luminous fragrance between tension and attraction, it is a darker, and much more spicier fragrance journey than Issey Miyake's previous fragrances for men.Issey Miyake Nuit d'Issey has a woody and spicy character with a leather backbone. It is contains citrus tones that make this unusual essence a crisp and mysterious ode to wood. Issey Miyake Nuit d'Issey begins with zesty citruses of bergamot and grapefruit, over a mysterious trail of leather accords, enhanced with spices, black pepper, woods and vetiver. The base notes are rich dark woods, patchouli and incense with tonka bean. Issey Miyake Nuit d'Issey Bleu Astral is a new light in the night, where the sensuality of leather meets the vibrancy of vetiver and ambery woods. 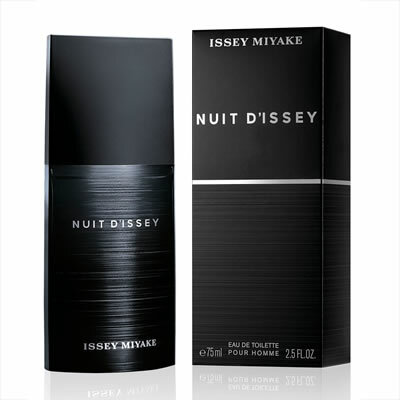 Issey Miyake Nuit d'Issey is a leathery, woody, fresh Eau de Toilette. A luminous fragrance between tension and attraction, it is a darker, and much more spicier fragrance journey than Issey Miyake's previous fragrances for men. Issey Miyake Nuit d'Issey Parfum is a woody, leathery, intense fragrance: an olfactive reinterpretation of Nuit d’Issey’s theme.